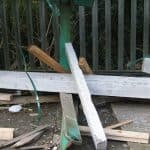 It is usually an Environmental Health Officer (EHO) from the local council, or a Health and Safety Executive Inspector that demands that a company obtains an inspection of its cantilever racking by a ‘technically competent person’. Cantilever Racking is a storage system usually utilised to store long and irregular or even awkward shaped products that cannot be accommodated in Pallet Racking. Often the inspection reveals “Red Risks” which require immediate offloading of those racks or locations. Typically the response of the client when asked to carry this out, is that the situation has been “like that for years” and that “nothing has happened yet”. Often the Cantilever Rack is only partly loaded. The nature of stock levels rising and falling depending on trading conditions, seasonal conditions, availability etc, typically results in utilisation levels rarely rising above 80%. This often provides an increase in the factors of safety present on a rack or system basis. The stock densities or weights are often lower than allowed for. This can be due to customers overstating the actual figures either mistakenly or deliberately, or the supplier overestimating the figures for the same reasons. Stresses redistribute through the structure creating a stable system albeit one in danger of collapse if other factors change. Materials used in the production of the racking happen to all be on the high-end of their thickness tolerances. All commercially produced steels have a thickness tolerance which is plus or minus an amount depending on the type and specification of the raw material. Many racks are designed on a statistical average figure based on statistical probability. It should be borne in mind that there is then an equal chance that instead of the materials being at the high-end of their tolerances they are all at the low-end. If, however, the combinations of factors that have prevented the rack or component from failing change and create an adverse overall effect, then the conditions for collapse to occur may all be in place and then sudden failure can result. 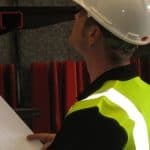 The rack inspector in reality is not being ‘too fussy’ when issuing Red Risks, they are simply highlighting that the luck that has been enjoyed preventing failure of those components or racks may at some time run out and then…. Watch out! It may be too late!